This 22 cu. ft. Amana. Chest Freezer comes with 3 Wire Baskets to help you find favorites fast. DeepFreeze. Technology is ideal for long-term storage so you don't have to worry about that Rocky Road turning into a milkshake! This 3.8 cu. ft. chest freezer offers an environmentally friendly R600a refrigerant and an energy efficient foam insulated cabinet and lid. The manual defrost system makes it easy to operate and the freezer's rust-resistant interior liner makes it super easy to clean. Not only that, but this model also offers a worry-free 12-month warranty on parts and labour along with convenient in-home service. You'll never have to worry about a shortage of frozen food storage space again with this spacious 7.2 cu. ft. chest freezer. Energy efficient, this model provides a foam-insulated cabinet and lid, plus an easily accessible mechanical thermostat mounted to the front. The rust-resistant interior liner is simple to keep clean, and the smart power indicator light conveniently lets you know when the freezer is working. The Frigidaire Frost Free Upright Freezer features a spacious 16.7 cu. ft. capacity, an ENERGY STAR rating, and enough adjustable organization options to keep even the fullest of freezers in order! Digital controls and multiple operation alarms help in ensuring that food items stay as fresh as possible. This Frigidaire 8.7 cu. ft. Chest Freezer makes for a wonderful addition to any home! Features include a Store-More removable basket that provides a convenient lift-out storage solution for your favourite foods, the Power-On indicator light that lets you know when the freezer is working, and easily adjustable temperature controls that let you choose the right settings for your frozen items. 21.7 Cu. Ft. Chest Freezer with 3 Slide-Out Baskets in White This 22 cu. ft. Amana. Chest Freezer comes with 3 Wire Baskets to help you find favorites fast. DeepFreeze. Technology is ideal for long-term storage so you don't have to worry about that Rocky Road turning into a milkshake! 21.7 Cu. Ft. 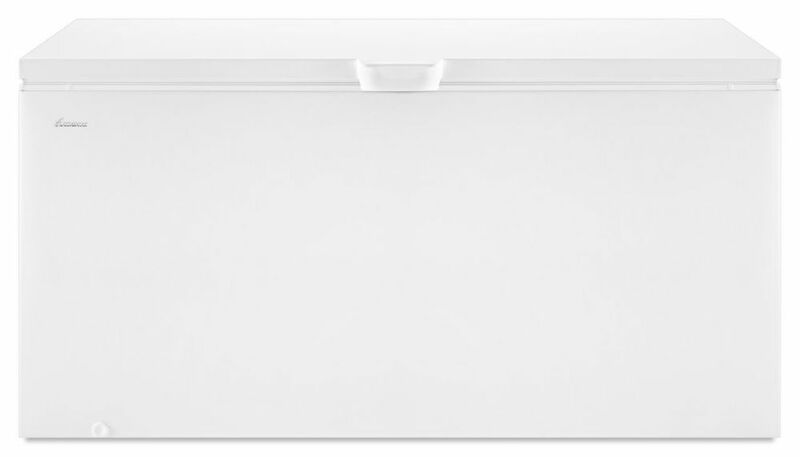 Chest Freezer with 3 Slide-Out Baskets in White is rated 4.0 out of 5 by 2. Rated 3 out of 5 by pir2 from Good product Works well. Nice to have the 3 baskets on top but if placed on the seams of the interior it leaves an air gap which causes frost at those points. You must keep them all in the centre which means moving them every time to get something from the bottom. Would have been nice to have a light for the interior also. Rated 5 out of 5 by the wild side from Excellent price and reliability I own 5 for my business. Excellent quality and reliability. My freezers see the same abuse in my retail environment in one week that one would normally see in months. Hi Mike, AZC31T22DW has an Energy Rating of (kWH/year) 386 and with its 22 cu. ft. capacity, you can easily store all your family's seasonal and bulk favorites. Hope this helps, thank you for your question!